// Gobal Variables and declarations. Before we can use Fast Startup we need to make sure your computer is configured to Hibernate. Press Windows Key + x + a to open a command prompt with Administrator privileges. If you don’t have admin rights beg your IT person to enable Fast Startup for you. If that doesn’t work, you can make a cogent case to your manager about how slow startup is having a corrosive effect on your productivity. Furthmore, make a passionate plea about how your slow machine leaves you disgruntled and is having a deleterious effect on your health. If he or she simply gives you a dispassionate stare or flashes an incredulous brow raise – threaten to quit. You don’t need to work in an environment like that. hahaha, ok let me stop. Next we need to open Regedit. REG ADD is a neat utility that lets you modify the registry from the command line. The REG ADD command modifies the key and changes the HiberbootEnabled DWORD to 1 in a single statement. It also has the serendipitous effect of making you look cooler if someone walks by your desk while you’re using it. After you make the registry change the effects should be immediate. Now when you boot up your computer you should notice a substantive improvement in start up time. Andif you have a UEFI enabled device it’ll be even faster. Fast Startup is great but it’s not the panecea for every slow startup woe. In some cases it may have an adverse affect on your system. For example, it can cause your computer to unceremoniously reboot when the Sign-in screen appears. Also some people say Fast Startup causes the system to freeze on shutdown or startup. Admittedly, this is more of a concern on computers that dual-boot Windows 8; however, I bring it up here because I want you to know that Fast Startup isn’t perfect. If your computer is generally slow try deleting useless files and speeding up Firefox, Internet Explorer andChrome. You can also go for a Solid State Drive, which will yield instant gratification. If you encounter any issues with this feature please let me know in the comments! The Process must be receiving its messages. In order to go around this problem, I place my calls to SendMessageToProcess in a while loop, which waits to the receiving application to send back a WM_COPYDATA message confirming reception. To add a function that send a message to a Process, perfoms the steps listed bellow. NOTE: These steps assume that the name of the CWinApp-derived object is CMyWinApp. How to solve the error LNK2019: unresolved external symbol – function? I get this error, but I don’t know how to fix it. 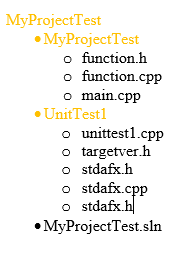 One option would be to include function.cpp in your UnitTest1 project, but that may not be the most ideal solution structure. The short answer to your problem is that when building your UnitTest1project, the compiler and linker have no idea that function.cpp exists, and also have nothing to link that contains a definition of multiple. A way to fix this is making use of linking libraries. Since your unit tests are in a different project, I’m assuming your intention is to make that project a standalone unit-testing program. With the functions you are testing located in another project, it’s possible to build that project to either a dynamically or statically linked library. Static libraries are linked to other programs at build time, and have the extension .lib, and dynamic libraries are linked at runtime, and have the extension .dll. For my answer I’ll prefer static libraries. You can turn your first program into a static library by changing it in the projects properties. There should be an option under the General tab where the project is set to build to an executable (.exe). You can change this to .lib. The .lib file will build to the same place as the .exe. 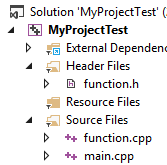 In your UnitTest1 project, you can go to its properties, and under the Linker tab in the category Additional Library Directories, add the path to which MyProjectTest builds. Then, for Additional Dependencies under the Linker – Input tab, add the name of your static library, most likely MyProjectTest.lib. That should allow your project to build. Note that by doing this, MyProjectTest will not be a standalone executable program unless you change its build properties as needed, which would be less than ideal. 100 is the max length of the buffer. You should adjust it as per your need. The  is the scanset character. [^\n] tells that while the input is not a newline ('\n') take input. Then with the %*c it reads the newline character from the input buffer (which is not read), and the *indicates that this read in input is discarded (assignment suppression), as you do not need it, and this newline in the buffer does not create any problem for next inputs that you might take. Read here about the scanset and the assignment suppression operators. Note you can also use gets but …. The following code is a build up on the basic “hello world” program I showed you earlier. Take a minute to review it, maybe even key it into your compiler and run it, and then we will break it down so that it is easier to understand what is actually going on. Well isn’t this a whole mess of code! The first thing that you may have noticed is #define WIN32_LEAN_AND_MEAN. This syntax prevents Visual C++ from linking modules that you aren’t going to need in your application. Moving on we come to the include line #include <windows.h>. This includes all the headers you need in this application. Sometimes you may want to include <windowsx.h>, which will give you a few useful macros to use in Windows development. The first function we arrive at is the WndProc function. We’ve discussed this before, so I am just going to highlight two lines I have added here. These two lines are essential as they declare the device context that we are going to use to output to the window we create, and the string that we will display. As we continue on in the code we arrive at the switch statement. This switch is used to determine the message being passed to the windows procedure. In this particular instance we want to take a closer look at the WM_PAINT block. When the window is moved, resized, or is otherwise changed the window needs to be updated. The first noticeable change here is the use of the hDC device context. The win32 function BeginPaint() returns the graphics device context for the hwnd passed to it. You can then use this hDC to set the text color with SetTextColor() and follow up with the TextOut() function to display the text. If you want to know more about these functions, check out MSDN. Next function up is the WinMain() function. Most of the WinMain() content is pretty straight forward, but were going to review a few parts of it for good measure. The msg variable holds the message received by PeekMessage() from the queue, and will be sent to TranslateMessage() and DispatchMessage(). The variable done is a Boolean value used by your message loop and will not equal true until a WM_QUIT message has been received from the queue to indicate that the application is about to be closed. For easier understanding we will break the order of each setup task into a list. We now have a fully working Windows application! I encourage you to toy around with the code and alter it to your liking. Don’t be discouraged by errors or problems, for it is these things that make us better. s your network safe from intruders? With all of the different methods that intruders use to weasel their way into your network and servers, you can’t be sure. Hackers will use trojan horses, backdoors, compromised user accounts, and the front door. That is right, the front door! Ok, maybe a side door, but unless your Windows environment is protected, an intruder can use a door to your house that was put there when you made the installation. This “door” in a Windows operating system is the anonymous connection. Back in the days when security was a secondary and even tertiary concern, computers used anonymous connections to do a variety of different tasks. The problem is that these tasks have been secured, even though the access has not been denied or removed. Therefore, there are many avenues into your computer from quite a few different angles that you might not even be aware of. What can an Anonymous Connection Accomplish? I am sure I have your attention now! The question that must be on the tip of your tongue must be, “What can someone do if they gain anonymous access to my computer?” Of course the answer is “it depends!” It depends because it is based on not only what they acquire from your computer, but what they can do with it. An anonymous connection is not something that you can make by accident. The syntax is not so simple that just anyone can make the connection. The point here is that if you have anonymous connections being made to your servers, someone is deliberately trying to gather information and you need to take immediate action. Once you have the computer names or IP addresses of the computers, you can attempt to make anonymous connections using the command above, or any “hacker” tool that exploits the anonymous access. Microsoft has been aware of the anonymous access problem for quite some time. 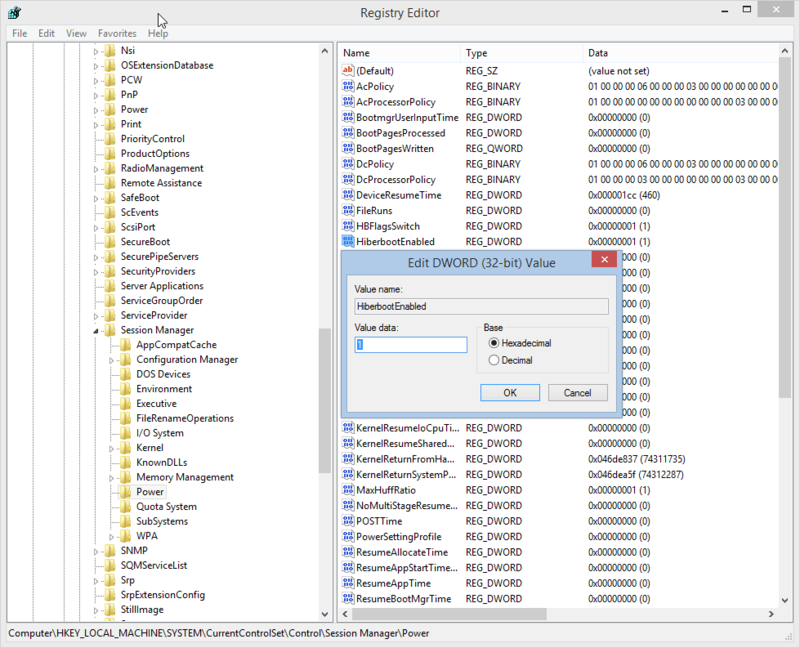 For Windows 2000, they implemented a Group Policy Object setting which allowed you to control how and if a user could create an anonymous connection to your computer. The setting is located in the Computer Configuration portion of any GPO. If you go below the Computer Configuration to the Windows Settings | Security Settings | Local Policies | Security Options, you will see the first GPO policy is related to anonymous connections, as shown in the figure. This policy can be configured to three different levels: 0, 1, and 2. These levels are displayed in the policy editor a bit differently, which is explained below. The Registry value that is being modified is HKLM\System\CurrentControlSet\Control\Lsa\RestrictAnonymous. Here is an explanation of the settings and what they protect against. This does not restrict any anonymous connections. This is a very insecure setting, but it is also the default on a Windows 2000 computer or domain. This is designed to not allow any anonymous access list the SAM or shares. However, there is a small problem here that this does not protect against all methods of accessing the SAM or shares from an anonymous connection. This setting is in essence no more secure than the Level 0 setting. This will deny all access for anonymous connections gaining access to the SAM or shares. This setting is not suggested, due to the impact it has on down level clients and applications that rely on anonymous connections. Windows 9x and Windows NT computers will not be able to establish a netlogon secure channel. Windows NT trusted domains will not be able to establish a netlogon secure channel. Users of Windows NT computers will not be able to change their passwords. The browser service will fail on all computers where this level is set to 2. When Server 2003 arrived, there were some distinct changes with regard to the control of anonymous connections. The old Windows 2000 anonymous GPO policy was still there (in a round about way), but it was accompanied with many more policy settings. The settings are welcomed, especially with the poor control over anonymous connections that Windows 2000 provided. The main problem is that the descriptions, documentation, and features of each setting were not very clear. Figure 2 shows the anonymous control settings in a Group Policy Object from a Windows Server 2003 environment. The following is a list of each setting that directly controls anonymous connections, as well as a description as to what the policy controls. Network access: Allow anonymous SID/Name translation – This policy controls an anonymous user’s capability of obtaining the SID of a user by knowing the name, or vice versa. With tools such as user2sid and sid2user, allowing this access can quickly give away the built-in administrators name. Network access: Let everyone’s permissions apply to anonymous users – This policy controls the access that anonymous users have once connected. In previous versions of Windows, anonymous users were provided with the SID for the Everyone group on the authentication token, allowing them to access everything that the Everyone group had access to. In Server 2003, the default configuration is to remove the Everyone group SID from the token generated for an anonymous user. This provides added protection for anonymous users attempting to access resources. Once this policy is set, anonymous users will only be able to access resources for which the anonymous user has been explicitly given permission. Network access: Do not allow anonymous enumeration of SAM accounts – This policy is designed to negate anonymous connections from enumerating the list of user accounts from the local SAM (member servers and desktops) and Active Directory domain controllers. Network access: Do not allow anonymous enumeration of SAM accounts and shares – This policy takes the previous policy one step further, by not only negating enumeration of user accounts from the SAM, but also shares on the targeted computer. The shares that are negated include standard, hidden, and hidden administrative shares. There are other settings that control anonymous connections to specific shares, named pipes, etc. These are typically not as powerful as the settings described above in negating anonymous connectivity to a Windows computer. By default your Windows computers are not safe from anonymous connections. Settings do exist to help you control these connections, but they are more effective on a Windows Server 2003 computer. If you do your due diligence and test these settings in your production network, you will find that you have quite a bit of control over these anonymous connections. If you still run Windows 2000 computers, you might want to consider moving up to Windows Server 2003, if for no other reason, to help restrict these anonymous connections.